This formula reduces to Daniel's squaring function when w = 0 and reduces to the standard complex squaring function when w = z = 0. Bugman, welcome to the forum! That "Mandelbrot-White2-large.jpg" pic really is droolsworthy - the texture is really odd, something like smoky sorbet icecream. Does using voxels instead of polygons (or other techniques), help in the calculations for the sub-surface scattering? David, your latest is also stunning, like an intricate ice sculpture. I'm very very impressed when I look at your renders. You are very good in 3D fractal rendering and I think we have to learn from you :-). 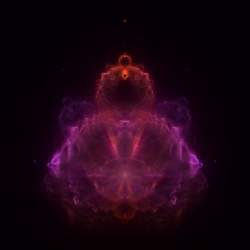 I looked at you website http://bugman123.com and I see that you have big collection of fractals also 3D and very interesting physics simulations. I'm waiting for some animations with hypercomplex fractals made by you. Does using voxels instead of polygons (or other techniques), help in the calculations for the sub-surface scattering? As far as I know, there is no practical way to calculate participating media with polygons. I think it makes more sense to use voxels or calculate the potential during the render. It might also be possible to use point clouds (in a manner similar to 3D IFS). Lycium suggested using Bounding Volume Hierarchies (BHV) for faster 3D IFS rendering. sorry for nitpicking, but the "foggy" rendering method employed here isn't really participating media in the technical sense of the word (it is not approximating the physics of light transport); having said that, it does look really cool, and has the distinct advantage of being waaaay faster! about the BVH, that's just my interpretation of how Hart's method works - it implicitly creates a BVH using the IFS transformations during traversal. looking forward to more cool renders guys! I tried to derive formula for Distance Estimator for Hypercomplex Mandendelbrot 3D and I have some conclusions. It looks very easy but... IT NOT WORKS PROPERLY I made some renders and it looks very strange. I tested this and it looks on renders of slices like real Distance Estimator in every dimension. Unfortunately I still don;t have idea how to calculate Distance Estimator for hypercomples numers. Here's another render of the "True 3D" Mandy, rendered using my improved WIP formula for Julibrots/Quats/Hypercomplex etc. with solid based on directional distance estimation (using deltas rather than the derivative) (time 45mins @3840*2880 on a 3GHz P4HT in single-threaded mode) - max. iterations allowed was 60. David, some time ago you wrote some about using deltas instead derivatives. Could you describe what you mean? Maybe only way is use some numeric method for calculate this. > Could you describe what you mean? To use deltas I iterate at two points on the ray at each step, the current point and the current point plus a little bit, I then basically use the smooth iteration value from each of those iterations to calculate the distance estimate on which my next step distance is based. I also have another version that's based on quadratics but that requires another iteration for each step (either at current point-a bit or at current point + 2*a bit). The main problem with these methods is that when a ray just misses the "solid" then the calculated estimate just after passing the solid gets much too large, the solution I found was that for each ray before you adjust your estimate (from the above) to give a step distance check the estimate against a current minimum for this ray at this iteration depth and if the previously stored step minimum for the iteration depth is less than the new value then use the previous value, otherwise store the new value as the minimum for this iteration depth. I've still got the odd bug in the algorithm - sometimes it ends up in an infinite loop stepping zero, a situation that's not that easy to debug in UF (it's easy to fix with a fudge but I want to find out what's causing the problem). Also I still haven't decided which of the two methods above is the better, though I've just about ruled out the quadratic method (mainly for speed reasons). Make that "and if the previously stored minimum estimate for the iteration depth is less than the new value"
Note that at the moment I also check the new estimate against the next 3 iteration depth minimums as well and store it for those if it's smaller, I dd that instinctively I haven't actually checked carefully to see if it actually makes any difference. I side-tracked myself into using my 3D IFS formula to render using primitives rather than pure IFS. David, some time ago you wrote some about using deltas instead derivatives. Could you describe what you mean? Actually I have released a colouring formula to the UF formula database that basically uses the second method I gave in my other reply - the colouring is a class colouring "MMF Directional Distance Estimator" in mmf.ulb. It just ray-traces in 2D. Scratch that, I was mistaken. There is a method that works for those without using deltas but I don't think it's exactly the same as the DE method for quaternions. The main disadvantage of using the delta method is that it's slower because you have to use two full iterations per step and because the estimate produced is not as accurate and not as linear as standard DE. Actually it's 3 to 4 times slower for quaternions. The advantage of the method using deltas is that it's generic for just about any multi-dimensional numbers - the problems with the algorithm are essentially common to all so once you've got say quaternions rendering accurately then so will other number forms (provided you can calculate a reasonably accurate smooth iteration value). Anyway I just retested rendering a quaternion using the 3 delta methods I mentioned previously (i.e. including the quadratic one) against using standard quaternionic DE. The visual result for the delta methods was best for the Newton 2 method (I say Newton as they are based loosely on using Newton's formula) and as that's almost as fast as Newton 1 it's the method I will impliment in publicly released formulas. where 1e10 is 1/1e-10 where 1e-10 is the "bit extra" along the ray, s0 is the smooth iteration at the current point and s1 is the smooth iteration at the current point plus the bit extra. It's actually basically the method I used in the 2D directional distance estimator colouring. Note that in the 3D version I actually convert the estimate to a step distance by dividing the estimate by (2.5*@scale) where @scale is a user parameter allowing a user to control the accuracy/render speed - a value of 1.0 was used in the testing, this gives pretty accurate result fairly quickly but using @scale values up to about 4 will improve results though obviously at the cost of longer render times. Finally I have rendered rotated view of Mandelbrot 3D in high resolution. Watch in HD! Wow, how awesome is that?! For all those frames one would think you're using a 40-core from the future. And in your own raytracer too. Did you use global illumination?